Have you considered a major change in Western Society? Even into the 90’s people who were carrying cameras with them were not that common. Even the digital cameras were expensive enough that many didn’t have them. Today! Today nearly everyone is carrying some sort of digital camera with them. To be honest, a cell phone/smart phone with a built-in camera. In the past when anyone came across anything unusual, like if they spotted a ghost, UFO, or… Sasquatch, they likely didn’t have a camera with them. Now, almost everyone has a camera with them, in their pocket, or in many cases in their hand. If Sasquatch is out there, why don’t we have pictures now? I mean pictures that show more than a shadow. It really adds doubt to their existence. It doesn’t mean there aren’t any Sasquatch, they could just be more elusive than expected. There was a type of large cat found recently in Florida that had remained undiscovered until recently. Myself, I believe that if Sasquatch exists, it might just be something besides a primate. 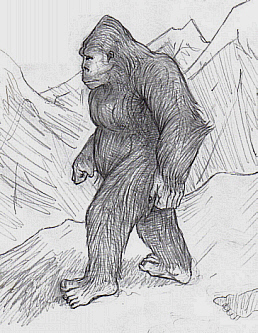 Do you think many folk would be disappointed if Sasquatch turned out to be some other animal — very intelligent, walking on hind legs, covered with fur, with a vaguely manlike face? This entry was posted in Parable Worlds, Parable-ic, Parables of Latitude, Uncategorized and tagged believe, camera, conspiracy theory, Digital camera, nonficiton, primate, Sasquatch, Sasquatch Sasquatch where for art thou Sasquatch, speculation, technology, theory. Bookmark the permalink.